The LIDAR fires from Phase Two of Crary. LIght Detection And Ranging is commonly known as LIDAR. It is used scan the lower atmosphere for solid particles and the upper atmosphere for chemicals. 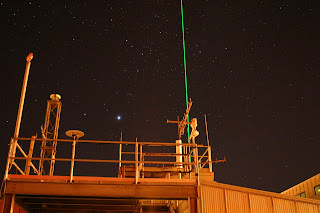 It shoots a laser at the sky and the reflected light is analyzed to figure out what the laser is looking at. Since 1990, an Italian-American group has been using a LIDAR system on base to observe Polar Stratospheric Clouds (PSC), which somehow correlate to the quality of the ozone layer that keeps us from getting burnt to a crisp by the same rays that create those lovely auroras. Each day that the sky is clear the research associate, B-Nelson, fires the LIDAR. This past Saturday, I got to see it. I had no idea the laser would be so visible. The beam is only one to two inches in diameter. When it is fired, B-Nelson lets it run for fifteen minutes to take three different observations and then sends the data off to those who want to know. 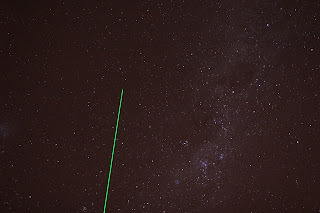 The LIDAR's end point in the sky. Personally, I'm not so sure it is collecting information. When B-Nelson sets off the LIDAR, he puts signs up everywhere to make sure no one gets near where it is firing. If someone did, they could be blinded and burned by the beam. Sure, you could say that any beam that is strong enough to reach the atmosphere has to be strong enough to damage a human. I'm not buying it. Think about it. A human will block all the sun's rays (a shadow). The ozone only blocks part of them (we still get sun). If this LIDAR system can damage a human, just think what it could do a thin layer of gas. I think they are burning a hole in the ozone with this fancy laser. CFCs are all a lie. Bring back the styrofoam that McDonald's served everything in. Using paper wrappers is accelerating the destruction of the world's forests. This message has been brought to you by an Onion inspired news source. 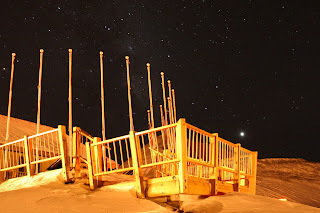 The chalet deck with Jupiter above the railing. *chuckles* i've missed your satirical ways...it was subsided for awhile but i'm glad it's back!